Listening to music is one of the best things to do. You can enjoy music to make your mood better or to get rid of boredom. Most people love to listen to music for entertainment. They become picky when deciding for new earphones. Fact, for your budget you want to get the best possible quality and features. There are many brands available on the market, providing earphones of different varieties. 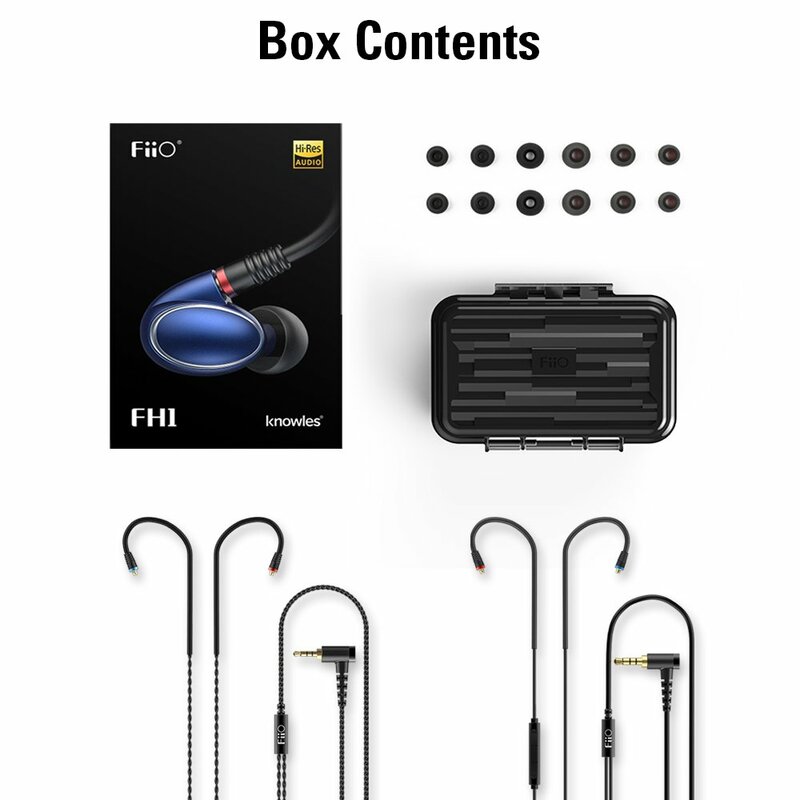 The FiiO FH1 offers some unique features and specifications that you will not find in other earphones. I provide you with a complete review of the FiiO FH1 in-ear headphones (affiliate link) to clear all your doubts about this product. FiiO’s FH1 are well-known because of their good quality of sound. The unique features of the headphones are becoming the source of attraction. The FiiO FH1 easily attracts you because of its sound quality, durability, and its Android compatible microphone. Their unique design makes them durable. The sound is bass-driven and of good quality. Best features of the earphones can fulfill the requirements of the user. There are two drivers in these headphones which produce the best sound effects. It is based on wired technology. You will get six pairs of silicone ear tips and a waterproof carrying case with it. The case can be used for storage purpose. Both of the things will be given to you for free. So, you do not need to buy additional accessories. This can save you money to get higher value headphones right in the beginning. These earphones are made of high-quality material, and you can use them for a long period. The FiiO FH1 earphones have dual drivers. One driver is a 10 mm titanium diaphragm. It is a dynamic driver and responsible for producing abyssal lows. While the other one is the highly-acclaimed Knowles 33518 BA. This provides attractive note sound in the mids and treble. Having earphones with dual drivers is definitely a benefit. You will get the best flow of different sound effects, which can enhance your experience by a lot. FiiO FH1 is manufactured of high-quality material. This is definitely a plus. You will be happy because they will probably last for a long time. These earphones are designed in a way that can give the best sound result. They contain a perfectly crafted crossover design. It will give you the best-balanced design. The earphones provide you with precise sound effects which you can enjoy more. The FiiO FH1 headphones (affiliate link) have detachable cables. The cables have a specific MMCX connector at its ends. They supply the sound to the user with either single-ended audio cable with in-line microphone and control, as well as a 2.5 mm balanced cable. This is a great feature which will enhance your experience. You can get the FH1 earphones with you at any place easily. While getting earphones, a most important thing is the quality of sound they produce. No one wants to compromise on the quality of sound. The sound of the FH1 is more bass-oriented. Because bass is the most fun and easy to recognize, it will not disappoint you. FiiO aims for bass-oriented big Dynamic drivers rather than V-shaped ones. I guess because most beginners look for bass power to start with. The isolation of the ear tips is also good. One of the best things is the easy control of the FiiO FH1. You do not need to know about any hard and fast settings to use them. It has the easiest control function that you can get. There are no hidden features in it. So, you can learn all the functions of this in-ear headphones easily on the fly. Another attracting feature of the FiiO FH1 in-ear headphones is that these have an Android compatible microphone. You just connect the earphones with your android phone. Then you can make calls and communicate through the mic with ease. Comfortability is the thing that matters the most after the quality of sound. You will never prefer to buy in-ear headphones that hurt in your ears. You can use the FiiO FH1 earbuds for long hours without feeling any pain inside your ears. They are so comfy, even after eight hours, I forgot I had put them on. These are one the best earphones for you if you fond to listen to music many hours a day. FiiO FH1 in-ear headphones (affiliate link) are high-quality earphones that you can get at a very affordable price. You can get the best sound due to its crossover wire technology. You will get a waterproof carrying case and six pairs of silicone ear tips for free. There is no need to spend money on extra accessories. Isn’t that great? If you like bass-oriented headphones, these are for you. FiiO did a damn good job with the FH1. So why don’t you start with these, right!? Next articleControl4 to Host Smart Home Demos Around the U.S.